When I first saw this range in Poornima's blog, I was so excited! I just love anti-ageing products. I believe that prevention is better than cure when it comes to lines and age spots. Also, my skin seems to agree with Pond's products- not always, but most of the time. But the main reason I was very interested in this range is because back when I had Melasma (hyperpigmentation) on my face, somebody told me to rub a piece of gold jewelry on the dark patches. 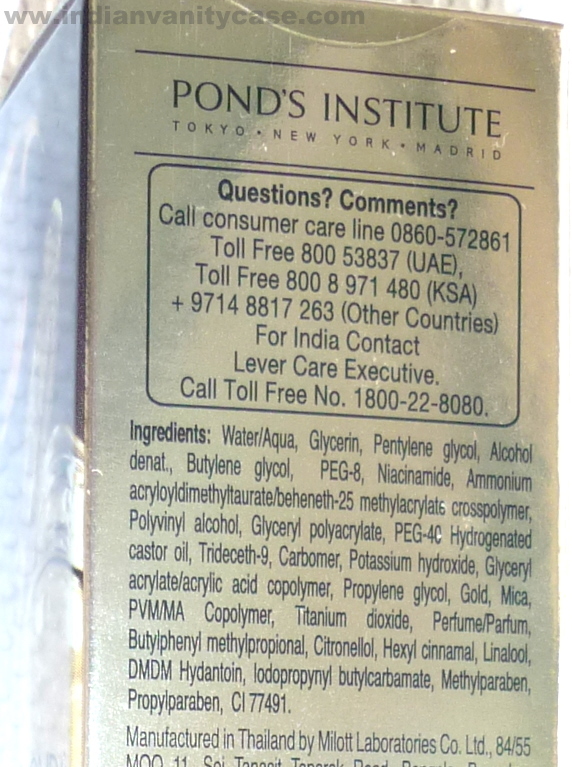 Supposedly gold lightens dark spots. I didn't try it, mainly coz I thought it was a moo point =D. Now I think I should have. Claims: Pond's Gold Radiance Precious Youth Serum is luxuriously infused with flakes of real gold particles, each concentrated drop of this most precious formula melts into your skin to smooth texture & helps boost your skin's youthful radiance. Contains Vitamin B3, proven to reduce age spots. I've been using this for only 2 nights and so far so good. It didn't cause any breakouts, which is my first concern when it comes to anti-ageing products. 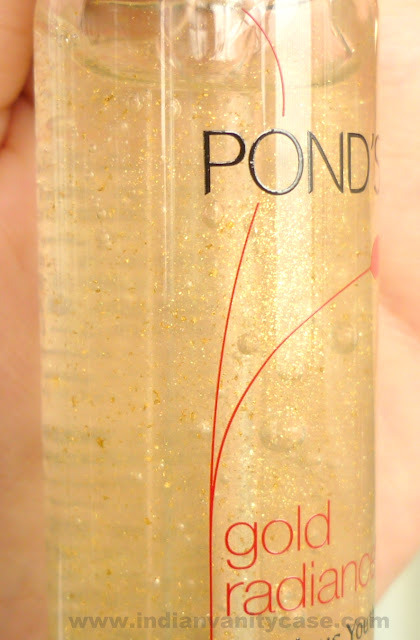 Yes, the gold flakes look like shimmer when applied on your skin. This is the reason I'll be using it only at night. The consistency is watery but not runny. It feels a little sticky when applied, but it dries in a few minutes & leaves the skin feeling firmer. It is quite moisturizing, so I don't apply anything else on top of it. Fragrance? Yes, nice and not too strong. Doesn't linger for long either. 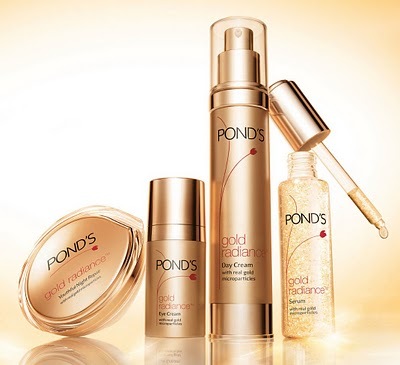 This is a luxury range by Pond's, so the price is also on the higher side compared to Age Miracle. 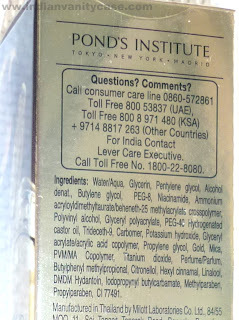 This serum costs Rs.899.00. For that price, I expect it to at least lighten my blemishes. Let's see. 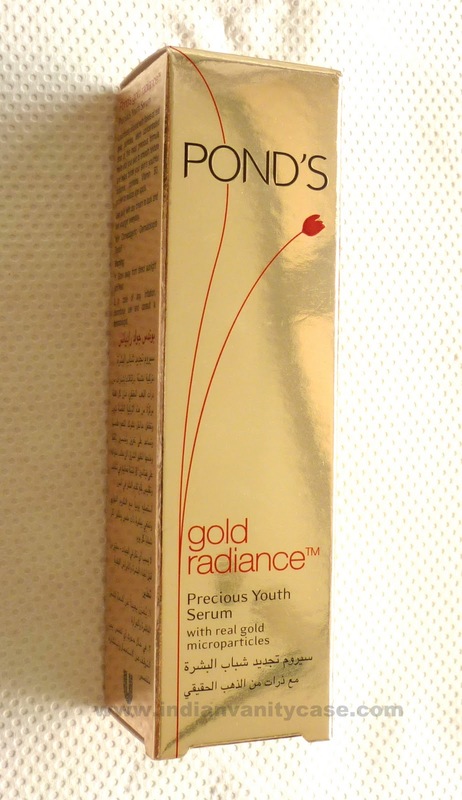 Other products in the Gold Radiance range are: Youthful Night Repair, Youth Reviving Eye Cream, Day Cream, Radiance Boosting Cleansing Mousse. The range claims to tackle wrinkles, age spots, uneven tone, and loss of healthy translucence, with real gold microparticles. Hey Love the packaging and hope it really works...Great review!! It looks so posh with all the glitter bits! & like Anju I too was eyeing your nail paint. Which one is it? indianmakeupways~ lol...it is a nail polish by Bloop. Waiting for the final review. Wow..Thanks for the heads up..Will wait for your review..As such I amloving their Age Miracle TM as well as the cream..Both were bought by me after reading your reviews Cynth..So if this is a gem..then I am for it. the serum is very sticky and the dispenser is NOT easy to use. olay is still better. 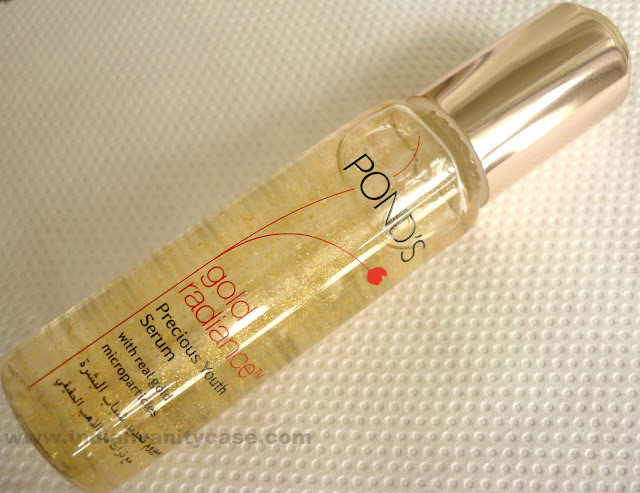 I have started using this wonderful product from ponds. Its been 3 days i can already see the difference. I will just waiting to apply. I have tried serum, day and night cream. immediately after applying on the face i can see the magic happening.Although its expensive but its an investment. I recommend all ladies go for this product. out of 5 i rate it 4.5. I am planning to buy this product but was looking a review done on this product. Your review is really helpful thanks! any idea about Kaya skin products plzz...?? Kaya are too expensive with very slow results.. I tried ponds gold radiance day nd nyt cream nd trust m my pimple almost disappeared.. I hav been using this product for 2 days nw.. Nd yes I can see visible changes..